Merle’s Door was recommended to me a few years ago, and although I took so long to follow-up, I saw it mentioned again somewher e recently and finally took the trouble to order it. I’m so glad I finally did! It has widened my ideas of what kind of relationship I’d like with my dogs and given me much food for thought. 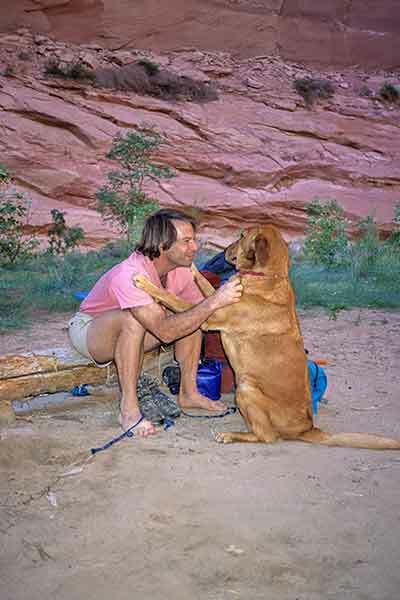 Ted Kerasote published his first book at seventeen and has written a number of books focusing largely on the interrelationship of humans, animals and our environment. 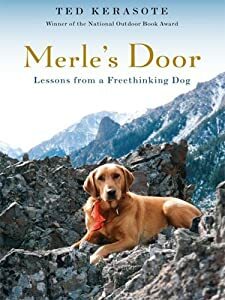 In Merle’s Door he tells the story of Merle, translating dog to human in an entertaining and compelling way. Merle finds him in the Utah desert and both their lives are changed. 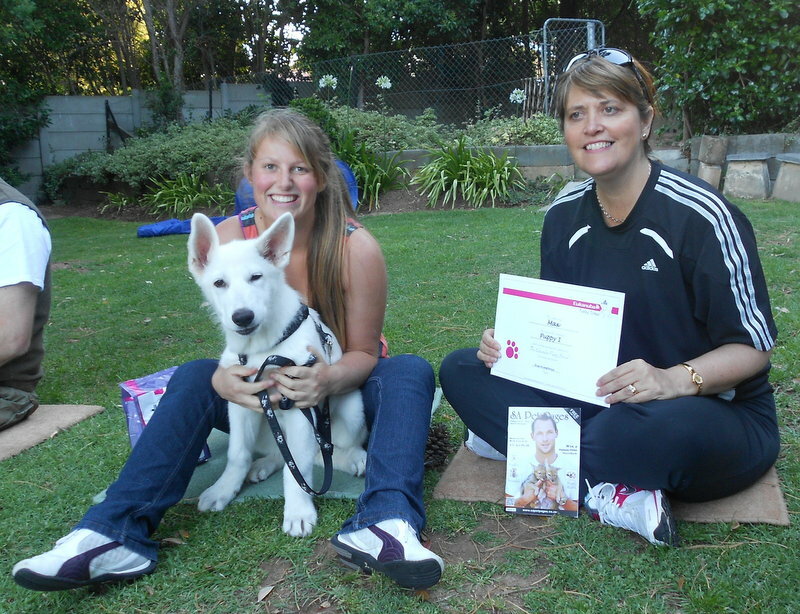 Through the book he weaves fascinating and at times controversial scientific and behavioural information into the narrative, sometimes challenging our traditional ‘dog and owner’ mindset. It felt like I was reading a love story as young Merle learns life with humans, and how Ted’s ideas of ‘owning’ a dog are blown away by the intelligence and wit of Merle. The particular circumstances of Ted’s life at the time meant Merle grew up in a small town where fences were unknown, cars were relatively few, neighbours knew each other and dogs could roam free. By choosing to have Merle as a companion instead of an underling, Ted frees up their relationship and gains a world by doing so. He makes a ‘dog door’ in their home so that Merle is free to come and go and he does! Sometimes with hilarious results, sometimes with almost tragic results – as when a big daddy moose comes to visit. You know how you read a book and love it yet when it’s done you can’t remember much? Well this one is so jam-packed with mental images and conversations that it will need rereading several times but there are a few snippets that will stay with me. One was Ted’s realisation that Merle didn’t often bark, and then realising that there were few barking dogs in his town. He comes to the conclusion that as there were no visible plot boundaries, dogs had less need to be territorial and even within their homes they grew up used to humans just opening unlocked doors and popping in to visit so felt no need to be defensive. This lack of boundaries meant that young dogs met other dogs early on in the crucial socialising period, quickly learning appropriate social skills and had an opportunity to choose their pals just as children do. Merle becomes the unofficial ‘mayor’ of the town, known in many shops as he did his rounds three times a day, loved by many. There were some parts that I cheered about – Ted’s unpacking of the ‘wolf = dog therefore dog is dominant’ fallacy for one; but there were a few things that will need further thought. Merle’s death is obviously inevitable but I didn’t agree with Ted’s decision to not intervene and put him down. The whole process of his dying and the memorial were beautiful and tearful, but drawn out to my possibly more down to earth South African mentality. Merle’s freedom would be impossible in urban society but there is still much to learn about our attitudes and limitations. Merle lived the life our dogs are dreaming about when they twitch in their sleep and how I wish more of them had even a tiny glimpse of that life. How much we humans miss out on when we construct physical, emotional and psychological boundaries around this species we have created and yet understand so little of. Thanks to Merle’s Door I have food for thought for myself and clients of Rose’s Puppy School for a long time to come. Oh my, you have to watch this video, it’s just perfect – will put a smile on your face and give you the warm fuzzies! Although there is the odd moment when the German Shepherd demonstrates her/his inclination to resource guarding, these are mates, having fun. Just what we want from our dogs. Favorite Video Friday – Best Friends.